Thanks for your response. First off, I agree from the standpoint of Fisher’s actual theorem, it doesn’t seem to be reflected explicitly in development neo-Darwin/moder synthesis theory. As an aside we may note that, just as Fisher defined the technical meaning of the word variance in the 1918 paper, so the first recorded occurrence of the word covariance is in The Genetical Theory (1930b, p. 195). Surprisingly, the above theorem did not appear explicitly in the literature until Robertson (1966). A more general form making allowance for changes in the character values themselves was given by Price (1970, 1972a). gene-frequency change is equal to the genic variance. The not-so fundamental Fundamental Theorem came later in the 1930 paper. 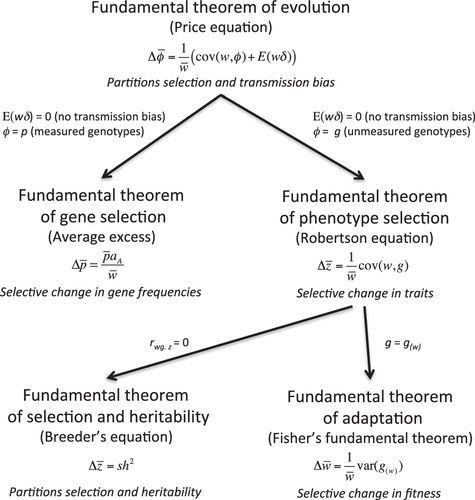 I scoured the earlier edition your book Theoretical Evolutionary Genetics to actually find a formula stating Fisher’s theorem, and that’s why I noticed it’s complete absence from earlier editions of your book, so I know from that, it is definitely your view Sewall Wright’s formula was foundational, not Fisher’s. So understandably I read the meaning of the paper differently than you would! But their choice of words and the meaning of what they are saying is worth clarifying. I leave that discussion between you Michael Lynch and Bill and John…. But, backing up a bit, my understanding is that according to Queller 2017, there is a move (including Michael Lynch and Walsh) to create the hierarchy depicted below. Also, while backing up a bit, there are three formulas. One is what I call the Bonkers Formula which Gruar apparently used to argue “If ENCODE is right, evolution is wrong.” This applies to recombining diploid populations like humans. The way I interpret the Bonkers Formula is that it is relatively independent of the mutation/selection balance formula. This formula would take precedence over the mutation/selection balance formulas since hypothetically, from a medical standpoint, we can have harmful traits that have neutral to “beneficial” selection coefficients. Thus the ratio of “deleterious” to “beneficial” is moot if the absolute number of deleterious traits is high enough. It doesn’t make sense that a population is getting better if for every increase of IQ points and memory we add a kidney defect…..thus there is the never ending clash of “fitness” in the pop gen sense vs. fitness in the medical sense. So as far as Michael Lynch’s studies on “compensatory mutations”, they are of little comfort to those suffering heritable diseases, since having 13 babies like Octomom doesn’t necessarily translate into more personal well being…. over 98% of all newborns survive to adulthood in most industrial countries. be a far smaller mutational load. So my reading of what you say is that independent of Fisher’s theorem, there is a point where enough bad mutation will lead to decline. My understanding (which could be wrong) is that mutational load may or may not be independently derivable from Fisher’s theorem? Is that right? These aren’t derived from Fisher’s formula, as far as I can tell. Aren’t they for the infinite population size case, and aren’t they assuming s is some fixed value rather than s being a mean? Do those formulas apply in the finite population case?? ?